The backsplash in a kitchen can really change your mood as far as to the overall look and feel. Kitchens are never really complete without a backsplash. It’s almost like owning a beautiful rose bush with no roses. The typical 4” backsplash made from Formica/laminate is not very attractive these days. Usually we remove them and bring the decorative splash all the way to the counter. This is a simple way to update your kitchen and give it the finishing touch. We have great selections that will really enhance your kitchen and make it all come together. First used to line the walls of underground railways all over the world from the early 1900s, the tile quickly became a mainstay in homes. Decades later this timeless tile is still popular..so why is this BKR’s favorite go to tile? It's Family-Friendly. Subway tile resists stains and is easy to clean. It's Timeless. It's simple charm feels nostalgic but works well with contemporary styles too. It's BUDGET-Friendly! Basic ceramic subway tile is inexpensive as you want it to be. You can spend more on different styles of Subway tile, but it still is the most economical tile going and that is why we use it. It's Fresh. 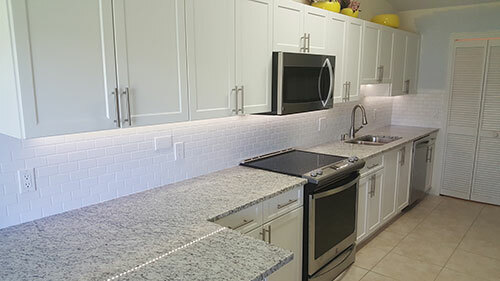 The reflective quality of subway tile brightens any kitchen or bath even without windows! It's versatile. There is more to subway tile than the standard offset patterns. There are several patterns you can install subway for the look you want, diagonal, vertical etc. You can accent it as well with a colored glass mosaic.